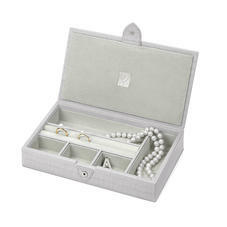 Aspinal of London's Paris Jewellery Box provides a home in which to keep all of your most treasured pieces. Individually handmade in our own workshops, each features a ring roll and five further compartments for earrings, bracelets, necklaces and your favourite watch. Plush suede lining has protective qualities while creating a striking contrast against the Italian calf leather exterior. 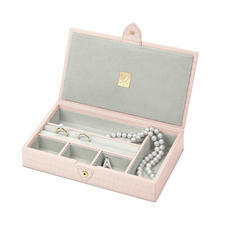 An array of shades will speak to every style, from traditional brown croc to contemporary raspberry pink. 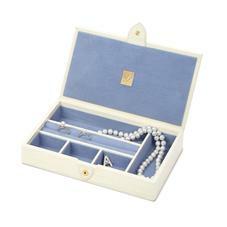 Individually handmade in our workshops by our master craftsmen, this gorgeous small jewellery box is perfectly crafted for a few of your favourite pieces. 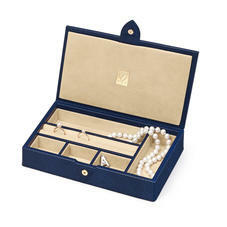 Enough compartments for earrings, brooches, bracelets and necklaces and of course a ring cushion. Apart from your man, the ideal companion for your next weekend in Paris. Simply beautiful and very chic.